Passed away 20.3.2019. Beloved husband of Barbara after 63 years of perfect marriage and family. 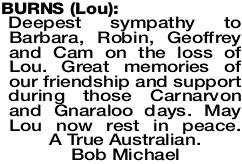 Father of Louis (dec), Robyn, Geoffrey and Cameron. In-laws Tania, Paula and Shane. 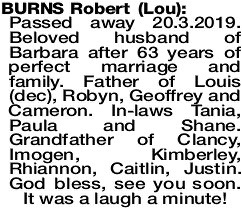 Grandfather of Clancy, Imogen, Kimberley, Rhiannon, Caitlin, Justin. God bless, see you soon. It was a laugh a minute! 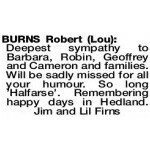 A Funeral Service to celebrate the life of Robert (Lou) Burns of Byford will be conducted in the West Chapel at FREMANTLE Cemetery, commencing at 2.00pm WEDNESDAY (27.3.2019). Our deepest sympathy to Barbara and family. 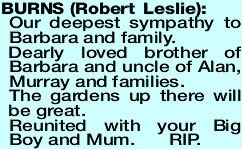 Dearly loved brother of Barbara and uncle of Alan, Murray and families. The gardens up there will be great. Reunited with your Big Boy and Mum. RIP. 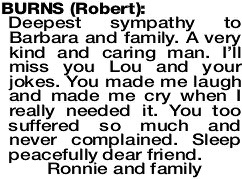 Deepest sympathy to Barbara and family. A very kind and caring man. I'll miss you Lou and your jokes. You made me laugh and made me cry when I really needed it. You too suffered so much and never complained. Sleep peacefully dear friend. 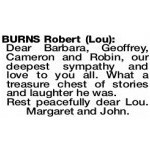 Dear Barbara, Geoffrey, Cameron and Robin, our deepest sympathy and love to you all. What a treasure chest of stories and laughter he was. Rest peacefully dear Lou. Margaret and John. To Barbara and Family, our deepest sympathies on your great loss. 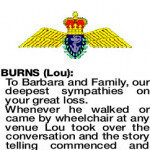 Whenever he walked or came by wheelchair at any venue Lou took over the conversation and the story telling commenced and what stories they always were, told as only Lou could. 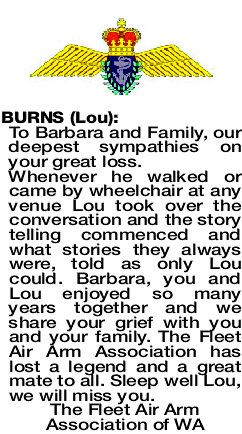 Barbara, you and Lou enjoyed so many years together and we share your grief with you and your family. The Fleet Air Arm Association has lost a legend and a great mate to all. Sleep well Lou, we will miss you.